Might want to check that all plugins you use are up to date. Other then that I think the best bet would be to contact Realmac Software Support. Give them as much information as you can about the problem, give them a link (Dropbox type) to get a copy of the project file(s) and give them screenshots of any messages you are getting. Might give them a link to this post. Since you’re not getting this on new projects, there’s got to be something specific to the older project(s). 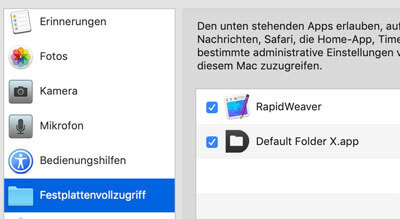 I don’t speak German, but if you’re suggesting full access for RapidWeaver? @joeworkman Please don’t allow full access to RapidWeaver, we have a fix coming (most likely tomorrow) that will alleviate the resource access problems. The problem isn’t completely solved - we’re waiting on Apple for that. Copying resources into a document will definitely work, the problem only occurs when referencing resources outside of the document. All new documents are set to copy by default. This has no positive effects. 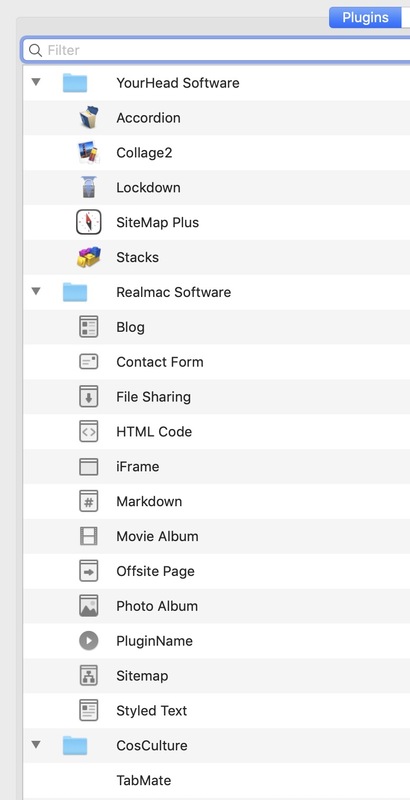 If you see “The document [name] could not be saved.” error, please, please send your project to support@realmacsoftware.com so we can get it fixed! Please don’t resort to giving RapidWeaver full access to your drive. It’s treating the symptom and not the cause. 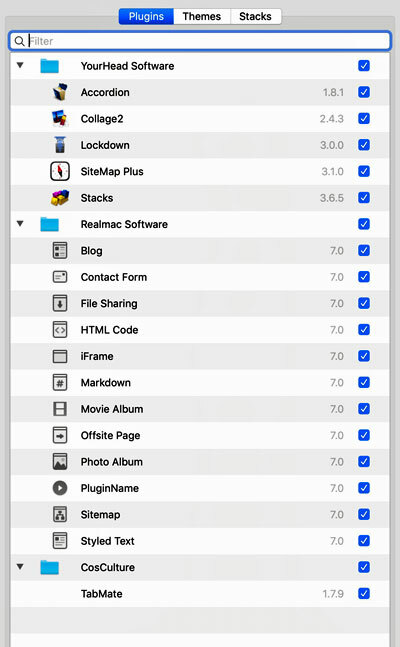 Schickst Du Dein Projekt an mailto:support@realmacsoftware.com ? @Volker Can you let me know which plugin versions you have? You can find this information by clicking the Addons button in the toolbar and expanding the folders. Thanks! Could you do the other side too, with the version numbers - that’s the info I really need. I know it can be hard to get all the plugins in the screenshot, there’s loads of them! You can collapse down the Realmac ones, I just need to know the version of the plugins you’re using in this project. I don’t know if it’s a plugin or not, but I’ve not been able to replicate it so far. It shouldn’t be the plugins. I deleted all plugins, except stacks. Even then I can’t save. I also deleted all pages and added a new stacks page with the text-stack. The result remains the same. @perherman What version of macOS are you using? 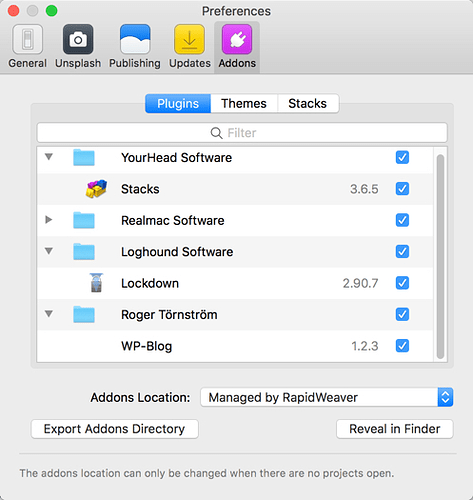 @Volker @perherman We’ve just released a new version of RapidWeaver, 8.1.2. I don’t think this version will fix your saving problems but it may give me the information I need to do so. Could you update RapidWeaver, open your project and attempt to save again. Thanks for the logs! I’ve been able to reproduce the problem now and I’m working on a fix! Hey guys, RapidWeaver 8.1.3 is now available and will hopefully solve this issue! Thank you very much, Tom. The problem is now fixed.